Reverse Engineering Service - Metallurgical Technologies, Inc. Reverse engineering is the process of identifying the material and processing used to make components so that they are produced with identical properties. Reverse engineering is accomplished by determining the material properties including chemical composition, heat treatment, coating type, coating thickness… (ect.). Anodized, phosphate, conversion coatings, etc. Microhardness testing through the cross-section of a carburized case hardened 9310 alloy steel pinion gear. Low magnification view of the cross-section of a ring gear tooth. 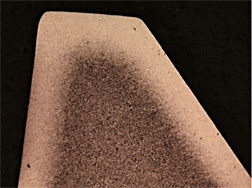 The tooth exhibits a uniform carburized case hardened structure. The core structure is quenched and tempered.